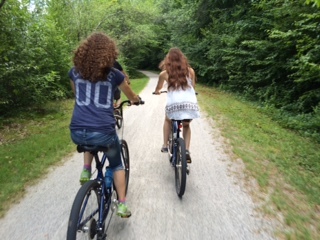 Bikes aren’t just a toy, or a means of physical exercise. What you often forget, once you’ve become an adult, is that they’re also a ticket to freedom. They open up new worlds of opportunity in terms of getting outside, riding around the block or to the pool or to a friend’s house, or even just being involved in something constructive and new. 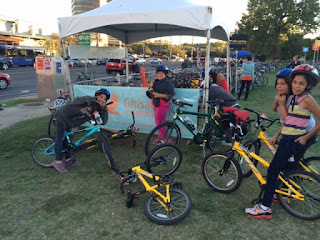 Ghisallo, a 501c3 in operation in Austin since 2011, puts on classes and clinics, ranging from one-day “Bike Rodeo” skill-based clinics to weekly “Bike Clubs,” typically in the form of semester-long after-school programs. 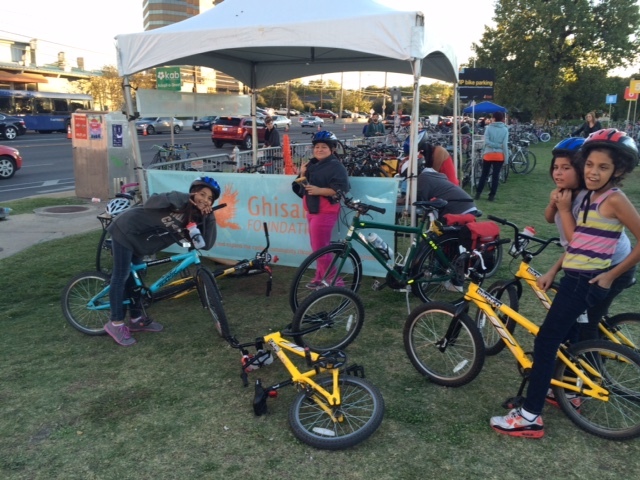 The “Earn-a-Bike” program encourages kids to learn how to repair a bike; if they don’t already own one, they receive a donated bike and work with an instructor to refurbish it. “Apprentice Mechanic” classes provide in-depth bicycle mechanical skills training and feed into a program that places outstanding students in paid apprenticeships at local bike shops and bike organizations. The Ghisallo name is one you’ll see everywhere, and it’s one that’s doing real work in the Austin community. If you’re looking for an event benefiting a worthy cause, look no further—in November, take part in one of the races or festivals below. “Beer, Bikes & Big Wheels” is what it’s all about, apparently. This event takes place in five cities across the U.S., and Austin is one of them; in fact, UAR was born here in 2003. Teams of two visit checkpoints across the city, taking on obstacles at each stop. Ghisallo is a beneficiary of the ride, and you can use code Ghisallo to save $26 per team when you register at http://urbanassaultride.com. Sign up to volunteer here. 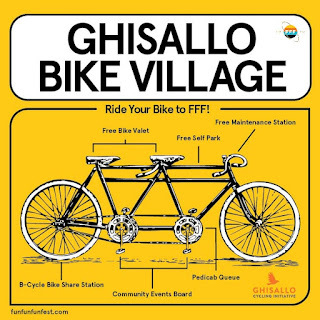 Now in its 10th year, Fun Fun Fun Fest is billed as “one of the most relaxed, creative, and pioneering festivals in music today.” The Ghisallo Bike Village will be a highlight for those traveling to the event on two wheels, providing secure parking for more than 1,500 bicycles. Split between a free bicycle valet by Bike Austin + Spinlister and a monitored self-park area, it will be the largest public bike valet to occur in Austin. The site will also include B-Cycle (Austin’s bike share system), free mechanical support, and a managed pedicab queue. 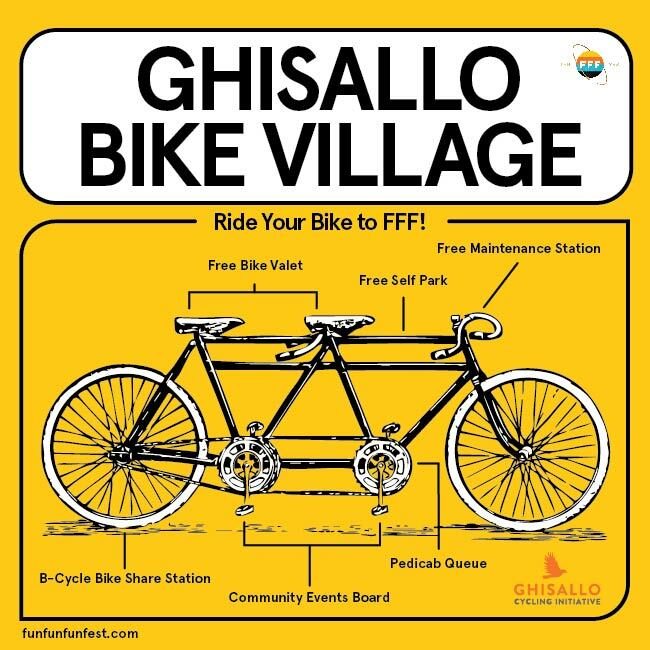 Ghisallo is a beneficiary of the event. 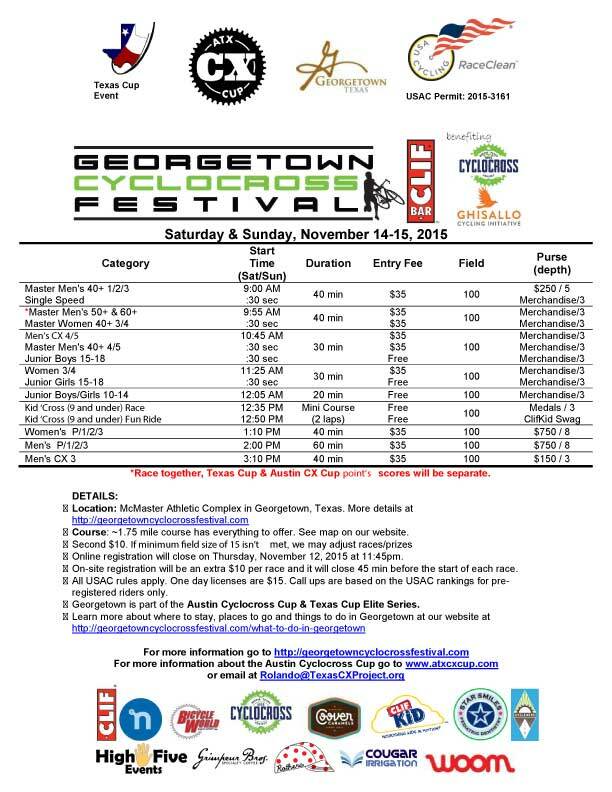 The Georgetown Cyclocross Festival, put on by the Texas Cyclocross Project, will kick off a dedicated four-week fundraising campaign for Ghisallo. The event is the Austin Cyclocross Cup finale and offers a roughly 1.75 mile course with a railroad tie run-up, 250 feet of sand, and bleacher seating for spectators. A beer garden, face-painting for kids, and lots of other fun extras make it an entertaining weekend for both racers and spectators. 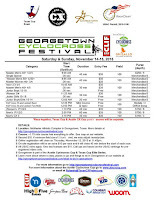 If you’re a supporter of women’s cycling, there’s even more reason to attend and support the Georgetown CX Festival: the women’s prize purse will equal that of the men’s P123. 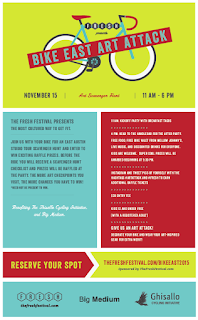 When: Nov. 15, 11 a.m. - 6 p.m.
A social-media scavenger hunt by bike for the artistically inclined, the second annual Bike E.A.S.T. takes you a tour of East Austin studios. You’ll earn valuable raffle tickets along the way for prizes, including the grand prize—a new bike from MJ’s. In addition to the swag, expect food, live music, and a worthwhile-in-itself experience of exploring great art and the East side. Cool for the kids: 12 and under ride free with a registered adult. The event benefits Ghisallo and the East Austin Studio Tour. For a discount, use the code ACT15. Living in Austin, the options for Halloween are endless. Now that our son is two years old and understands enough about what October 31 entails that he’s been talking about it since October 1, I feel a bit of pressure to take advantage of all the events going on around town. Theo loves being outside. 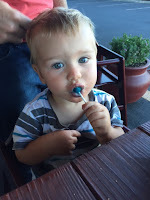 His round belly belies his affinity for running down trails and riding his balance bike at top speed; he’s a ball of motion that prefers to stay in motion until it is at last, sometimes forcefully, placed under the covers by his two exhausted parents. Well, for the week of Halloween 2015 he’s going to have so much activity he’ll be ready for lights out, because Mommy has carefully curated a long list of energy-burning events for all three of us. 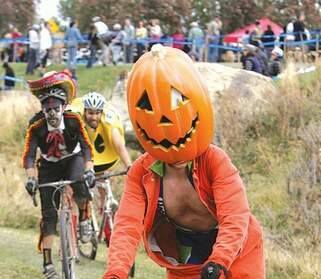 Expect the usual Tuesday night Dirt Derby fun, but with costumes! Decorate yourself and your bike. Last year’s costumed ATC run hosted such celebrities as Aqua Man, Cruella Devil, Snow White, and a Wizard-of-Oz triumvirate of scarecrow, Dorothy, and tornado. Expect to complete your choice of one of the usual Wednesday routes around Town Lake (roughly 2, 4, or 7 miles) at a more relaxed pace than usual, since there are capes, fins, hats, and such to contend with. 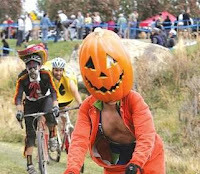 The winner of the costume contest gets a free pair of On running shoes. The little ones will have their own short run and costume contest in Butler Park to kick things off, along with other active games, prizes, and treats. (Meet at the shop at 5:30 p.m. to be ready for the kids’ event.) The group leaves ATC at 6 p.m. and reconnects after the run at the shop for local beers and snacks. UPDATE: Event cancelled for bad weather, as of 10/29. 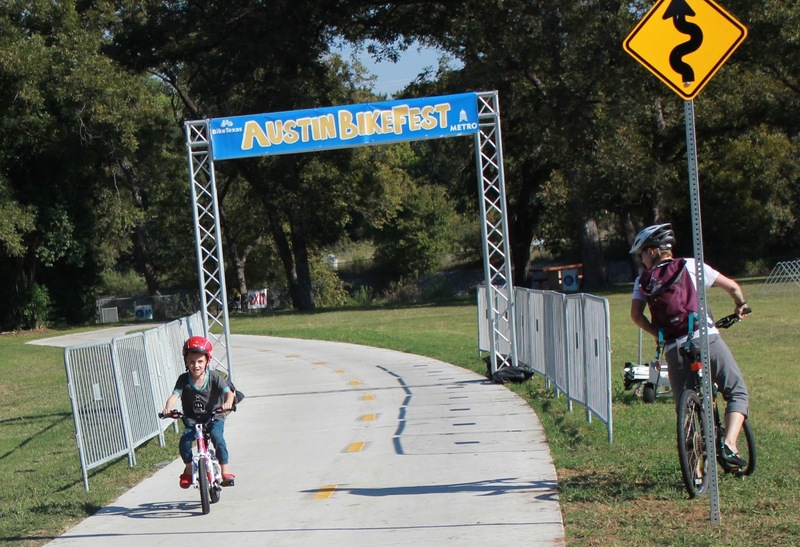 Last year’s Austin BikeFest was the first, highlighting the completion of the 7.3-mile Southern Walnut Creek Trail with a ribbon-cutting ceremony. This year’s event remains on the route at the trail’s southernmost access point, Govalle Park, and features a host of bike-themed activities and exhibitions for all ages. Free and open to the public, BikeFest will be held from noon to 4 p.m.
Anna Kong, development director of BikeTexas, says the turnout is expected to be around 1,000 people this Halloween. She points out that there’s a little something for everyone: craft beers (Independence Brewing Co., Uncle Billy’s, Austin Eastciders), food (Wahoo’s, Cold Ones Pop), a bicycle fashion show by Ilonka Designs, demonstrations of bike polo (ATX Bike Polo Social Club, noon-2 p.m.) and unicycle football (Unicycle Football League from San Marcos, 2-4 p.m.), bike games like “slow race” and “foot down”, a costume contest, vendor tents, unicycle lessons provided by the Austin Unicycle School, and more. Among the highlights: The KidsKup obstacle course, which is designed for children on balance bikes. A number of balance bikes will be available for children to try out on the course. 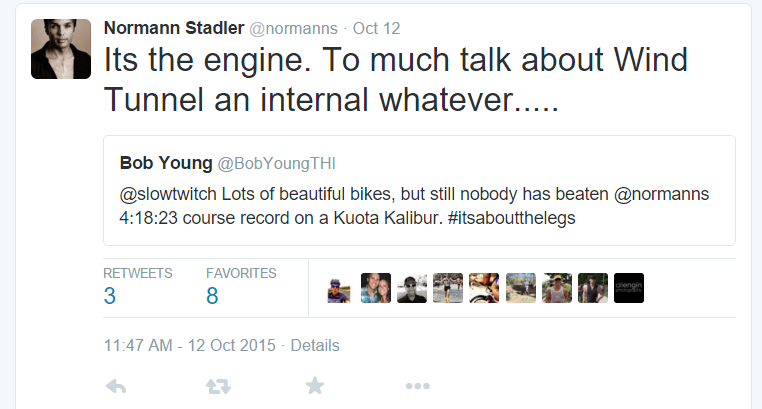 (Never heard of a bike without pedals, or an 18-month-old cyclist? Here’s a review of WOOM bikes on TexasBikeRacing.com.) An obstacle course geared more for older children and adults will include bike-thru haunted houses—but don’t worry, nothing will jump out at you and make you fall off your bike—and a bike bridge, bike teeter totter, and ramp made for novice cyclists. Every time I watch an Ironman, it blows my mind. The athletes are amazing, of course, but what shocks me each and every year I see Kona is the sheer span of time they’re on the course. While the live broadcast is on, you can watch it in passing as you go about the business of your own day—you can go on a long ride or run, get some errands done, take a nap, wash the car, eat three square meals, watch a couple of full-length movies…but don’t worry, they’re still out there, the poor souls. You haven’t come anywhere close to missing the finish. 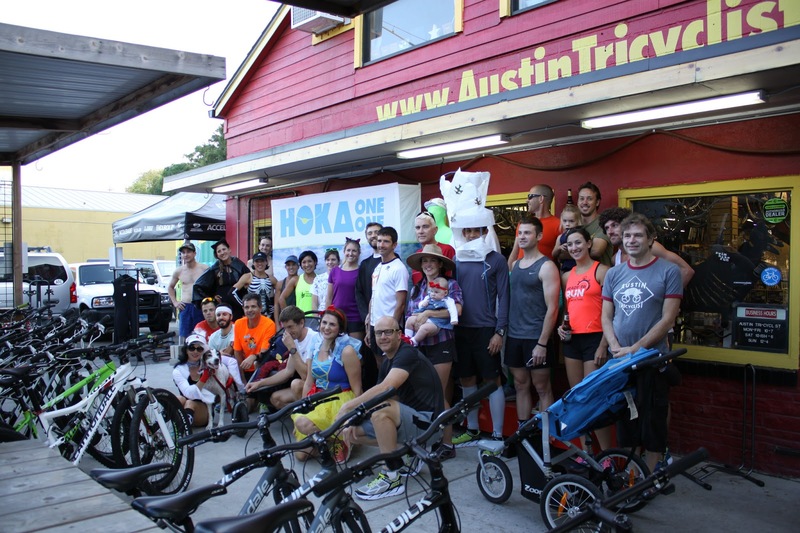 Austin had lots of quality representation in 2015: ATC was watching for updates from age groupers Mike Minardi, Jack Cartwright, and Toni Ferreira da Silva Neto. Kona tends to be extra windy and extra hot, so PRs for the distance are rare; not everyone’s race went as planned or hoped. The experience of qualifying for and attending this prestigious competition, however, is an accomplishment in itself. As an added bonus for Minardi and his fans back home, his photogenic good looks got him on IRONMAN’s highlight reel and Triathlete.com’s favorite finisher photos. My husband and I were also following Jeff Symonds, a Canadian pro we’d hosted a few times for the Longhorn 70.3; he was racing his first Kona and looking good, but had a mechanical on the bike course. He still managed to finish the run in about 2 hours and 50 minutes (third fastest run time this year), so despite bad luck the first time around, he could be one of the favorites going into next year. There was a surprise in the women’s race that caught our attention, as well: Mirinda Carfrae dropped out midway through the bike; she’d had a crash on a training ride leading up to the race and was injured. You usually expect Carfrae, an incredibly talented runner, to give the strong cyclists a run for their money (literally) in the final miles. She’s the current course record holder for the women, with a time of 8 hours 52 minutes and 14 seconds. Updated with info from the 2015 race, Jack Mott’s Kona Bike Stats post on the ATC blog delves into bike tech and bike course records from the ’90s to the present day. Check it out here. The NBC coverage will air November 14, so you’ll still have a chance to view the 2015 Kona highlights if you missed the live feed. 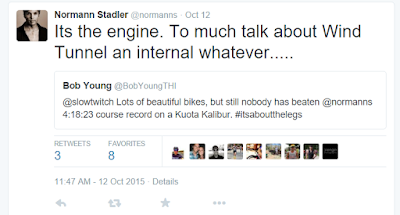 The action and drama will be condensed to 1.5 hours, though, so there’s no way you’ll get a true perspective of just….how….long…an Ironman can be. ATC is proud to introduce Harrison West, first child of shop manager Kaleb West and his wife, Megan. We checked in on the West household and the other youngsters of the ATC family to see how things were going. Here's what they said! "When Harrison was born (2:15 p.m. on Sept. 11), he was 7 pounds, 13.4 oz, and 21.5 inches long. He's up to about 9 pounds already!" What are Harrison's favorite things? "Harrison currently enjoys relaxing in his baby swing, getting snuggles from mom and dad, and above all else, pooping." Who do you think Harrison looks like? 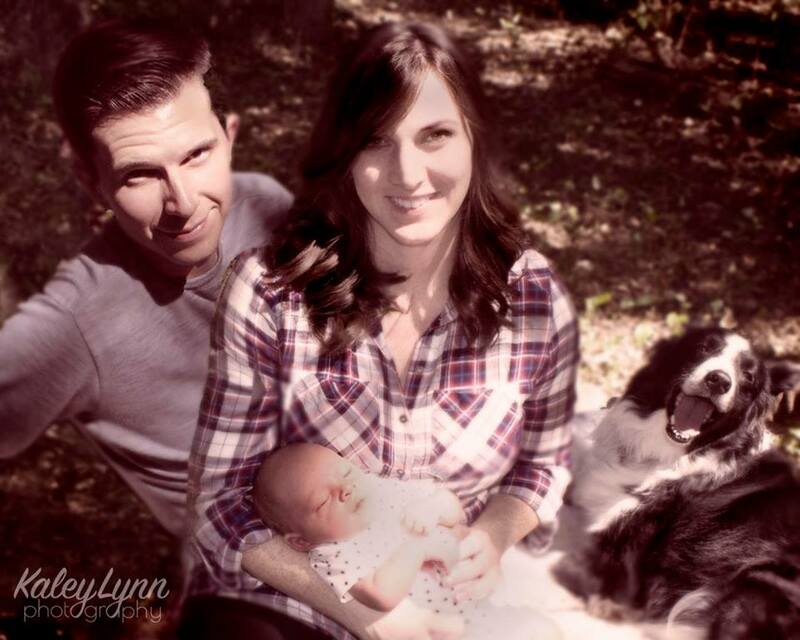 "We've heard that people think he looks like Megan and Megan's dad. He also has Kaleb's toes, but we aren't sure he looks like either of us yet." What's being a new parent like? What's the funniest thing that's happened since Harrison arrived? "It's hard to get away from potty humor here... Probably the funniest thing that's happened so far was a few days ago, during a routine diaper change, Harrison started peeing. Then, while peeing into his own ear, he pooped on Mom." Taylor, 18, is a freshman at St. Edwards University (studying theater). Emily, 14, is a freshman at Westlake High School. Emily is also involved in theater and will be running track in the spring. She likes sprints, not distance. Addie is 3.5 and Jack is 1.5. Both are card-carrying Thinkery members and you can find them hanging out there weekly. Addie enjoys trying to outrun mom and dad and is getting pretty quick. Jack is determined to keep up also and is looking forward to being big enough to take his sister's Woom bike out for a spin. Raiding the nutrition isle at ATC is also a fun game they like to play. They dream of one day opening a bike shop and will probably name it after themselves. Theo is now a little over two years old and is very large for his age. If he's not destined for a future in endurance sport, he could make one heck of a linebacker. 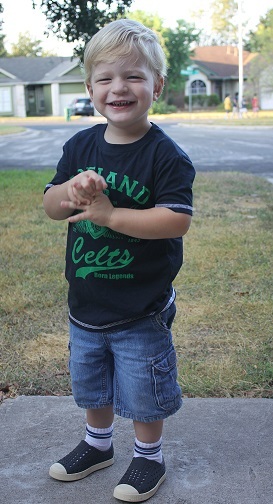 He loves being outside, finding spiders and bugs, building with Legos, and riding his bike. Anytime he heads down the street in a car, real or pretend, he's "going to the bike shop." I bought a new pair of shoes at ATC yesterday, Altra Provision 2’s. I’ve never been a good reviewer of bike frames—they feel good or they don’t, and I can’t really tell you why. With running shoes, my opinion is similarly cut and dry. What I observed with the Altras: They felt very different, which happened to be exactly what I was looking for. Now that the bike racing season is over and I’m trying to run, I’ve been battling what’s probably a manifestation of my same old hip/lower back issue, this time in my left foot. I’d gotten to the point where I knew I had to do something or give up running altogether. I weighed my options, which ranged from seeing a doctor to changing my equipment. Since “equipment” in running means shoes, that was an easy enough place to start. But which kind? 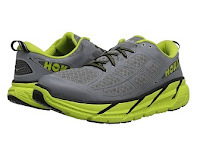 ATC carries HOKA, ON, Altra, Saucony, Newton, and Zoot brands, all with different selling points and fits. Employee Kimble West guided me through the options when I told him my suspicion, which was that my left foot was turning inward. 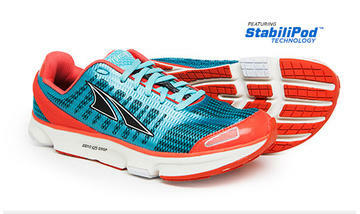 The Altra Provision 2 is a zero-drop shoe with a good deal of cushioning and a wide toe box. In the past I’ve worn more of a “traditional” run shoe, never something so flat or wide. I’m almost hesitant to say it worked because I feel I might jinx myself. But it seemed to. On my first two short runs (both on Day 1…I may have gotten a little carried away), I felt pain, but it was different, not the sucking-air-through-my-teeth sharp stab and then limping home, but something mild and manageable, something that didn’t feel like I was tearing or breaking anything permanently. My foot seemed to have more stability. It could be the placebo effect. It could be just a good day. It could be that many different kinds of shoes would improve things, giving my ankle and foot a different way to move. Or it could be that the Altra was the one shoe, Cinderalla-style, that could change my runs for the better, and it happened to be waiting for me on the shelves of my favorite bike shop. I guess my point with this long-winded story is that you never know until you try, so you should try. And if the quick fix works, why not take it? All the brands ATC sells allow a 30-day comfort guarantee, meaning you can get store credit for shoes that don’t work out. This is good timing to get a deal on older shoes with ATC’s run shoe closeouts, or to try on new arrivals like the Altra Superior or HOKA Clifton 2. The Hills and Ales run is a new weekly event at ATC (Monday, 6 p.m.), and this week Altra demos will be available for a test run. The group completes a looped hill repeat course in the Bouldin neighborhood, so you can do as much or as little as you’d like and choose your own speed. Afterward everyone meets back at the shop for beers, and this week there will be giveaways, including shoes and (for the first 20 people to arrive for the run) a free Newton Running pint glass. Check out the regular Wednesday night fun run on the Town Lake trail as well, also starting at 6 p.m.